You are here: Home / Blog - Adults / Are You an Emotional Eater? For many people, food can be a comforting friend when they’re feeling sad, overwhelmed, anxious, angry, etc. This wouldn’t be such a bad thing, if they ever craved healthy foods, like fruits or veggies. Nope, people more likely to crave foods that are sweet, salty, high in fat, or high in calories. Why is that? What we crave often depends on what our needs are in that moment. Maybe you’re hungry because it’s been several hours since your last meal. As long as you don’t wait too long (this is why you want to eat 5-6 smaller meals vs 3 big ones), you should be able to control yourself and eat a more well-balanced meal. However, if you’ve gone 6hrs since your last meal, you’re going to be famished, wanting to eat anything and everything in sight. Let’s face it, the processed, junky foods are usually the easiest to grab, which is when you’ll find yourself demolishing a pack of cupcakes or a bag of chips. Emotional cravings are a bit different. These happen not because we’re truly hungry, but because we like the way that eating these favorite foods makes us feel. You might find that pizza is your go-to food when you’re stressed or anxious. Or maybe you love chocolate when you’re feeling sad. What if what you’re craving is actually saying something about your feelings or specific emotions? Cheese or a milkshake: You’re emotional or feeling tense. High-fat dairy products are high in protein and contain the amino acid tryptophan, which aids in the production of melatonin and serotonin to help us feel more relaxed and sleepy. A 2016 study linked low amounts of tryptophan to a depressed state. Candy: You’re hungry, tired, stressed, or addicted. If you’re reaching for sweets, it’s really sugar you crave. You could need an energy boost due to lack of food (maybe you’re dieting or skipped breakfast this morning) and your blood sugar is fluctuating. Or, you’re not getting enough sleep. Another possible culprit is stress. 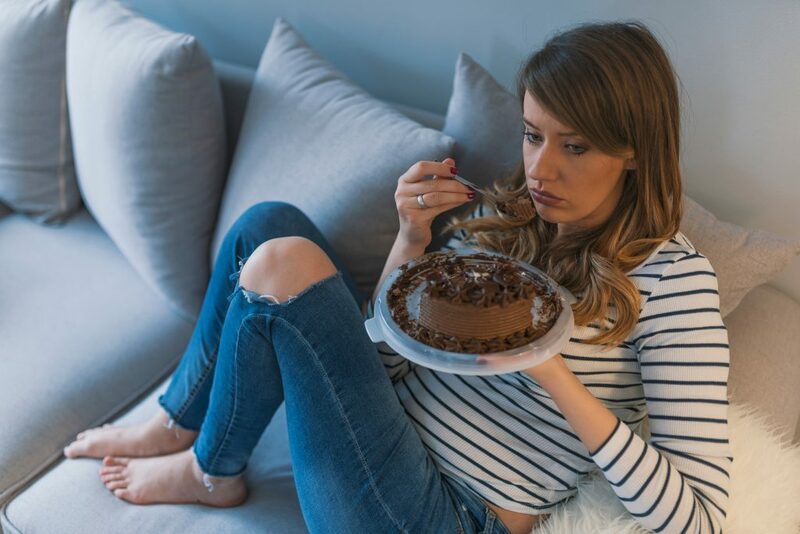 Brazilian researchers found that stressed women were more likely to crave sweets. If neither of these are the cause of your craving, you may be a sugar addict. In a study of rats, researchers from Princeton University found that sugar is as addictive as drugs. Salty chips: You’re stressed. Crunching on something helps relieve stress while you chew. You could also be anemic, which explains your quest for extra salt. Carbs: You’re depressed or dieting. A study published in the journal Obesity Research found that eating carbohydrates boosts our levels of serotonin (the feel-good hormone), which is why we want them when we’re feeling down. Another reason for carb-loading could be due to dieting. If you’re restricting your carbohydrate intake, it’s not surprising that your body is craving more. Chocolate: You’re sad, lonely, or stressed. Consuming 500 mg of chocolate a day for 30 days improved feelings of calmness and contentment, according to an Australian study. So, we could be craving it to boost our moods. Others say we crave chocolate as a result of a magnesium deficiency, but this is up for debate. After reading this, what do you think? Is it true for you? I know for me, I just love chips. Period. End of story. No, I’m not depressed, I just enjoy salt! It’s a bad habit, and one that I would argue is just as addictive as sugar! I’ve had to work hard to find chip substitutes, but you can do it if you’re motivated enough! I also don’t find myself craving anything if I’m stressed or upset. I actually lose my appetite when I’m feeling blue. I only eat when I’m happy, which is thankfully most of the time! Of course that has its downfalls too. It’s important not to use your happiness as an excuse to eat everything you want either. Years ago I had to get blood work done quite often during a rough time tied around getting and staying pregnant. I hated doing that blood work (who doesn’t? ), so I treated myself to Arby’s roast beef sandwiches, curly fries, and really unhealthy milkshakes after every appointment. Not the best idea! Thank goodness I didn’t have THAT many appointments! You definitely don’t want to do what I did. Instead, you should look at finding other ways to reward yourself that aren’t food-based. You might buy yourself something new (could be small things like a book, new shirt, etc). It may not feel as good initially, but you’ll feel better about it later when you’re not disgusted about how you would have felt after slamming down a Quarter-Pounder with Cheese. So what else can you do to limit how much and what you might be eating when you’re feeling emotional? Be aware of why you’re choosing to eat those foods. Are you eating them for the wrong reasons? It’s okay to want a milkshake every now and again. You just don’t want to drink one because you’re upset and that’s the only thing you think will make you feel better. Instead, try working on sorting out your feelings without food. Deal with the anger, sadness, anxiousness, extreme happiness, etc for the emotions they are without bringing food come into the equation. Get plenty of sleep! You will make better food decisions when you’re well-rested. When people have a tough night of sleep, they often find themselves grabbing the first foods they can find (ie processed, pre-packaged, high calorie/fat). Not only do they tend to crave those types of food, but they’re often too tired to think about cooking more nutritious meals. Researchers at Columbia University used functional magnetic resonance imaging (fMRI), which tracks blood flow in the brain, to compare brain activity in 25 volunteers following a normal night’s sleep (about eight hours) and a night in which they were limited to just four hours. In each case, the researchers performed the scans while showing the volunteers images of unhealthy foods interspersed with healthy foods, such as fruits, vegetables, and oatmeal. Brain networks associated with craving and reward were more active when the participants were sleep-deprived than when they were well-rested—especially when the participants viewed the images of unhealthy foods. Exercise more often! You will find that you’re craving HEALTHY foods after a good workout, walk/run, or just increased activities. Research shows that the highest increase in fruit/vegetable intake occurred for participants who transitioned from inadequate to adequate exercise. An added benefit for sure! As you can see, emotional eating can look differently for different people. Some people have never even experienced it! While you can now understand that there is some science behind what you’re craving and why, you don’t want to use this as an excuse to eat an entire bag of chips or a whole tub of ice cream. There are plenty of things you can do to create new, healthy habits! If you need help getting this done, let’s chat! As a Holistic Health & Lifestyle Practitioner, I help people figure things like this out! I can help you create good, healthy food habits, learn how to meal plan, understand how to read food labels, change your emotional eating habits, improve your sleep, increase your activity levels, discuss your relationships that might not be benefiting you, talk about your career choice, or anything else that is currently going on in your life! You’ve got nothing to lose by setting up a free initial phone call with me, but you have a lot to gain! https://www.sleeptasticsolutions.com/wp-content/uploads/2019/03/emotional-eating.jpg 684 1024 Ronee https://www.sleeptasticsolutions.com/wp-content/uploads/2016/08/SS-logo-new-with-massage-300x60.jpg Ronee2019-03-27 12:34:222019-03-27 12:35:06Are You an Emotional Eater?